Professor Rachel O’Reilly was presented with the 2012 IUPAC-Samsung Young Polymer Scientist Award at the recent IUPAC World Polymer Congress, held 24-29 June 2012 at Virginia Tech in Blacksburg, Virginia, USA. (see congress report). O’Reilly is the first UK winner of this award, which is presented every two years to the most promising young polymer scientist from any country under the age of 40. O’Reilly received an MA/MSc from Cambridge, UK, and a Ph.D. from Imperial College London. After a postdoc at IBM Research–Almaden in San Jose, California, and Washington University in Saint Louis, Missouri, she then began an independent position in 2005 at the University of Cambridge, UK. In 2009, she received a career-acceleration fellowship from the UK’s Engineering and Physical Sciences Research Council, which allowed her to establish her independence and move her laboratory to the University of Warwick. In the past three years, she has published some 50 papers and has a research group of around 20 researchers. In June 2012, she became a professor at the University of Warwick, UK, at the age of 34. 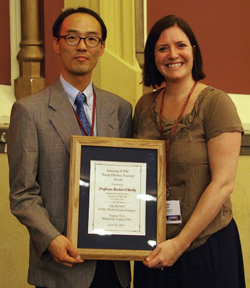 Rachel O'Reilly receiving the Samsung-IUPAC Young Polymer Scientist award from Minjae Lee, Samsung representative. Her research uses polymer synthesis to make novel nanomaterials, which can be utilized in a wide range of applications from materials science to medicine. Her interest is in trying to mimic some of the key features of natural functional nanomaterials such as viruses and cells, using polymer nanoparticles. Her group also works at the biological-materials interface to explore templating chemistries for polymer and oligomer synthesis. They utilize DNA as well as biopolymers for templating and are interested in the development of these techniques towards the preparation of sequence-controlled materials.